Legal Technology | Legal Technology Services | Litigation Support | E-Discovery | Legal Process Outsourcing LPO | Batish Technologies Pvt. Ltd. Legal Technology Services – Batish Technologies Pvt. Ltd.
Batish Technologies is a global consultancy and solution development company providing integrated business and technology solutions for legal industry. This includes Consulting, eDiscovery Solutions, Application Development and Maintenance services. At BT we aim to bring the right combination of products and services to create an effective and efficient solution for our customers. We understand that no two matters are same,hence apart from offering a range of standardized services, we customize our services to your specific needs. With our extensive experience in litigation support and Legal IT services we have developed good exposure to various of the shelf tools used in the industry and have developed number of tools internally which we use to deliver highest quality of service to our clients. Our teams are continuously testing and researching new tools and ways to improve internal systems and workflows. Operating on 24 X 7 model and with diverse office locations, our operations are flexible and always on, allowing to integrate with any law firm, corporate client, service bureau or legal consultant any where in the world. Application Development Customized desktop and web based solutions targeting internal workflows and ad hoc utilities that work to grow your business. of data and develop a case strategy. ability to work and promote latest technologies in the industry. set of processes which translate into cheaper processing costs while being flexible to match your individual corporate needs. We also provide a range of BPO services where our staff utilizes your existing infrastructure and Process your documents in-house at your premises remotely. Such an arrangement can be beneficial for situations when documents cannot leave your premises due to confidentiality or in Case you need an ad-hoc extension to your existing litigation support team. Review— Develop an understanding of the content in a document review platform. 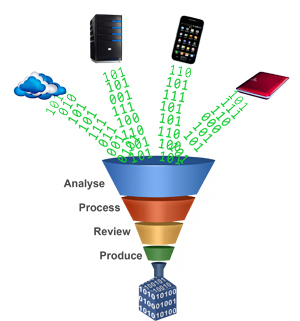 Analysis— A process to increase productivity at each stage in eDiscovery life cycle.